What’s that noise in the sky? Is it a flying lawnmower? What about that funny cigar shape? A UFO? If you’re in London right now, it’s more likely to be the European Goodyear Blimp – “Spirit of Safety I” – operating a major flying campaign in the London area. With the massive summer of events and sports in London, it’s hardly surprising. 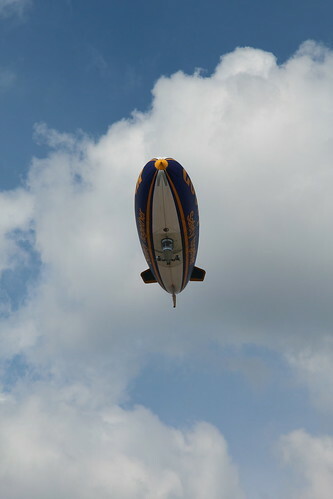 As well as advertising tyres, the Blimp also carries TV equipment to help cover major sporting events from the air. The blimp will be with us all summer long. It’s a daily sight in my neighbourhood at the moment, as I’m just on the edge of London City Airport’s airspace, which the Blimp has to skirt around on it’s way from it’s London moorings at Damyns Hall airstrip in the Dagenham Marshes, to Central London. Indeed, some people think the blimp is following them around, as it buzzes the skies of London. I sympathise with these last two. I used to be terrified of the damn thing too, and while that has long since passed, I still find it fascinatingly eerie. When I was little, the Goodyear blimp used to use the airport near the house where I grew up as it’s local mooring. I must have been about 5, enjoying a summer Sunday in the back garden, when the blimp appeared. Back in the 1970’s the European blimp, “Europa”, was silver and way noisier than today’s Spirit of Safety with it’s little engines.Why was it hovering over my parents’ garden? Spoiling my afternoon! Well, I ran in the house like a crazy person. And locked myself in the bathroom. Probably because it was the only room in the house with a lock on the door (so it couldn’t “get in” – we’ll ignore the fact it would have to get in the house and up the stairs for now), and the frosted glass meant it couldn’t “see me”. How do you feel when you see the blimp overhead? You might be on to something here, Leo. Some folk see “happy fun blimp”, you can almost imagine it with a smiley face on the front. Those who are apprehensive at worst think “Aieee! Hindenburg!”, while at best think of that Beatles film where they were being chased by someone in the Goodyear Blimp, or of Christopher Walken’s Bond villain orchestrating evil from his personal airship in View to a Kill.